Fisher & Paykel ICON Auto CPAP Device is the fully featured Auto CPAP which combines all of Fisher & Paykel Healthcare’s leading clinical technologies including their advanced Auto-adjusting algorithm and SensAwake™ Technology. 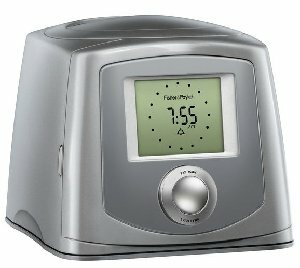 * ThermoSmart™ provides a more comfortable CPAP experience (Almasri E & Kline LR. Sleep 2007; 30(suppl): A190). * ThermoSmart™ improves sleep quality and total sleep time (Nilius GN et al. Eur Respir J 2008; 31(4): 830-6). * ThermoSmart™ lowers nasal airway resistance for 10% lower pressure (Massengill JS & Lewis KL. Sleep 2009; 32(suppl): A217). * ThermoSmart™ virtually eliminates condensation even in a cool sleeping environment2 whilst delivering high levels of absolute humidity (All humidification level claims are based on the results of testing performed by independent test house Valley Inspired Products, June 2010). * ThermoSmart™ is as effective as a nasal steroid in improving compliance and nasal symptoms (Powell E et al Sleep 2010; 33(suppl): A469). * Patients with pre-existing nasal conditions." Again quoting from F&P website: "SensAwake™ provides fast and effective pressure relief when the patient needs it the most - while transitioning from sleep to wake. This allows the patient to experience a more comfortable and restful night's sleep...SensAwake™ does this by searching for a pattern of irregular breathing which occurs at the transition from sleep to awake, as shown in the flow signal below. SensAwake™ senses this irregularity in flow and promptly reduces the pressure to aid the transition back to sleep". 1. Summary Data - Displays cumulative summary data from first use, as well as summary data for a 30-day period (Compliance Stats, Efficacy Stats, SensAwake Stats, & Compliance Metric). 2. Treatment Profile Summary - displays data for any consecutive 30-day period and includes summarized information on usage and efficacy data (AHI, Pressure, System Leak, & Usage and Humidity Profile). 3. Compliance Summary - displays patterns of CPAP use for 30 consecutive days (CPAP Patterns of Use). 4. Detailed Profile - displays comprehensive data for the last 7 days within the selected 30-day date range (SensAwake Stats, Hypopnea Stats, Apnea Stats, Flow Limitation Stats, Pressure, System Leak, & Run Time). 5. Treatment Table Summary - (Compliance and Efficacy Data). The SmartStick™ utilizes USB technology, which provides large data storage capacity. The F&P InfoSmart™ software provides a range of options to report the data to meet your needs. The physical SmartStick™ can be sent via the mail for data download, or the sleep data can be sent electronically via the web. To access basic sleep data on the display, turn the SmartDial™ to the Sleep Data setting and press to enter. Turn the SmartDial™ to either the CMS report (US only) or Patient report and press to enter. NOTE: The model name will display while in the Sleep Data setting. • Average Compliant Hours over the last 30 nights. Press the SmartDial™ to access the average for the last 7 nights and again for the last night. SmartDial™ to access the average for the last 7 nights. • The number of nights used since therapy commenced. NOTE: A symbol will appear on the Display Screen when the Sleep Data is within the compliance requirements. Once CMS requirements are met, the data within the CMS sub-menu will freeze. • Exit the Sleep Data setting ( this symbol will only appear if Additional Sleep Data is restricted). • Exit the Sleep Data setting. 1) Brightness of the clock display is adjustable. 4) To access the setup menu: Make sure the smart dial is in the default position (where the machine would start if pressed once). Hold down the smart dial button with your thumb while simultaneously using your other hand to rotate the dial 360 degrees clockwise until you are back in the default position. Don't release the middle button yet. Rotate the dial one pitch counterclockwise, release the middle button and you will be in the setup menu with all the options in the top left quarter of the screen. 5) Clinician Manual - I can find posts of people asking for it online, but I haven't found a copy or contacts or directions for getting it. 6) InfoSmart software - It was for sale on an Austrailian website for $39, but that site has been down since the end of last November. But, it appears that at least one of the members here has a copy. (There apparently is some unrelated software also called "InfoSmart" which makes internet searches a little frustrating.